Last weekend, on June 4th and 5th, the yearly event Radda nel Bicchiere was held in the center of Radda in Chianti. 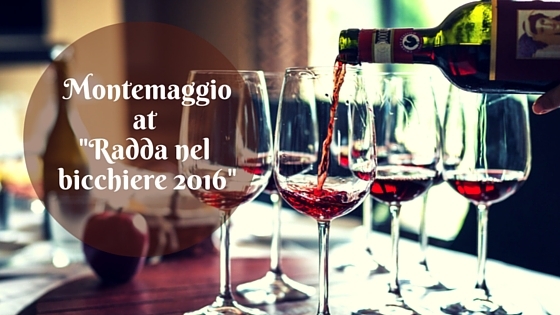 This wine event is organized by the Proloco in Radda in Chianti and is now in its 21st year. It is a true town festival where the different wine producers of Radda, including Montemaggio, each has their own booths, or tents, along the main street in this small town. People can walk around and taste the different wines at their own pace, while at the same time, they can sit down and rest for a while at any of the cafés or perhaps on a bench in the small and picturesque main square. Radda in Chianti is a small town in the province of Siena, located southeast of Florence and north of Siena. It borders the small municipalities of Castellina in Chianti, Castelnuovo Berardenga, Cavriglia, and Gaiole in Chianti. This area was inhabited as far back as 2000 B.C., and much later after the fall of the Roman Empire hamlets had been formed, such as Castelvecchi, Monterinaldi, Volpaia, and Radda, which all still exist today. During the Middle Ages, under the jurisdiction of the Florentines, Radda was confirmed in 1415 as the administrative center of the Lega del Chianti, which also included Gaiole and Castellina. While defining the statute of the Lega, they chose the black rooster on a golden background as the official emblem. As you all know, this emblem is the trademark of the Chianti Classico wine today. It was in this period, that the Chianti was added to the localities Radda, Gaiole, and Castellina. Radda has always been in the center of the Chianti Classico district map; however, during the last few decades it has had a come back with more smooth and fresh wines. The climate change has favoured, for example, the wineries in Radda with a more eastern exposure. For the more fervent wine connoisseurs, the programme also included different wine tastings organized specifically for the event. On Saturday, June 4th, the wine festival opened at the Radda in Chianti town hall with Radda meets Mount Etna, which aimed at comparing the similarities and differences in wines produced at a high altitude. The wine tasting was led by the wine writer Giampaolo Gravina. This was followed in the afternoon by Radda in Black, led by Davide Bonucci from Enoclub Siena, where wines from the Radda in Chianti producers were tasted in black glasses, along with a couple of added mystery wines, for the participants to guess their origin. During the Sunday, June 5th, there was another blind wine tasting and, of course, the following award ceremony announcing the winners of 2016 in the different Chianti Classico categories. Rosé di Montemaggio 2014 – A 100% Sangiovese wine. Chianti Classico di Montemaggio Annata DOCG 2010 – This wine is predominantly made with Sangiovese and only a small percentage (3-7%) of Merlot, which you hardly notice as the Merlot has here adopted the typical traits of the terroir in Radda. Chianti Classico Riserva DOCG 2009 – A 100% Sangiovese wine, with grapes selected from the oldest vineyards on our estate. Torre di Montemaggio IGT Toscana – A 100% Merlot wine. Quinta Essentia di Montemaggio IGT Toscana – This is a blend of 60% Merlot and 40% Sangiovese. To read more about our wines, click here.